Caught in the storm Jesus exhorts his disciples to take courage and discard fear. What a great reminder for us today! When fear threatens to choke our lives may we turn to the one who offers us strength and wisdom to carry on. 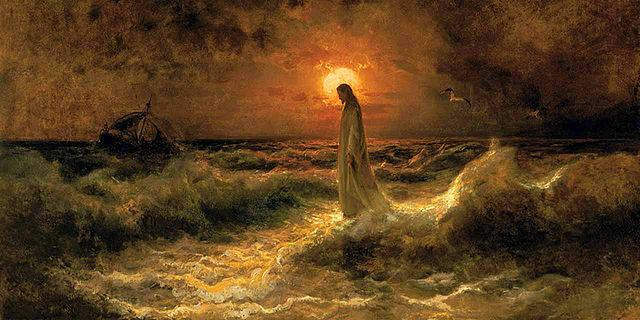 Christ Walking on the Water, Julius Von Klever, 1880. This entry was posted on Tuesday, August 8th, 2017 at 6:00 pm	and tagged with Catholic, Christian, Courage, Faith, Fear, Homily, Inspiration, Jesus Christ, Mass, St. Peter, Strength, Walking on Water, Wisdom and posted in Ordinary Time, Podcast. You can follow any responses to this entry through the RSS 2.0 feed.